Did People Ever Really Put Crocodiles In Moats? John A. asks: Are there any real examples of medieval castles having alligators in the moat to keep out intruders? A common image in pop-culture is that of a castle moat filled to the brim with water and hungry crocodiles. So did anyone ever actually do this? Before we get to that and why crocodiles in moats are probably not the best idea in the world, or at least not a very efficient use of resources if your concern was really defence of a fortress, we should address the fact that the common image most people have in their heads of a moat isn’t exactly representative of what historical moats usually looked like. To begin with, moats have been around seemingly as long as humans have had need of protecting a structure or area, with documented instances of them appearing everywhere from Ancient Egypt to slightly more modern times around certain Native American settlements. And, of course, there are countless examples of moats being used throughout European history. In many cases, however, these moats were little more than empty pits dug around a particular piece of land or property- water filled moats were something of a rarity. You see, unless a natural source of water was around, maintaining an artificial moat filled with water required a lot of resources to avoid the whole thing just turning into a stinking cesspool of algae and biting bugs, as is wont to happen in standing water. As with artificial ponds constructed on certain wealthy individuals’ estates, these would have to be regularly drained and cleaned, then filled back up to keep things from becoming putrid. Of course, if one had a natural flowing water source nearby, some of these problems could be avoided. But, in the end, it turns out a water filled moat isn’t actually that much more effective than an empty one at accomplishing the goal of protecting a fortress. 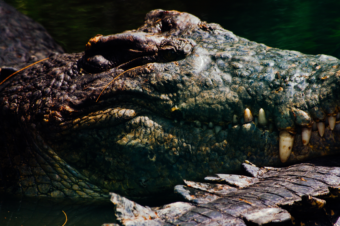 And as for putting crocodiles (or alligators) in them, introducing such animals to a region, beyond being quite expensive if not their native habitat, is also potentially dangerous if the animals got out. Again, all this while not really making the act of conquering a fortress that much more difficult- so little payoff for the extra cost of maintaining crocodiles. Unsurprisingly from this, outside of a legend we’ll get to shortly, there doesn’t appear to be any known documented cases of anyone intentionally putting crocodiles or alligators into their water filled moats. It should also be mentioned here that while at first glance it would appear that the key purpose of a moat is to defend against soldiers attacking at the walls, they were often actually constructed with the idea of stopping soldiers under the ground. You see, a technique favoured since ancient times for breaching cities, fortresses and fortified positions was to simply dig tunnels below any walls surrounding the position and then intentionally let them collapse, bringing part of the wall above that section tumbling down. Eventually this was accomplished by use of explosives like gunpowder, but before this a more simple method was to cart a bunch of tinder into the tunnel at the appropriate point and set the whole thing ablaze. The idea here was, after all your diggers were out, to destroy the support beams used to keep the tunnel from collapsing while digging. If all went as planned, both the tunnel and the wall above it would then collapse. To get around this very effective form of breaching fortifications, moats would be dug as deeply as possible around the fortification, sometimes until diggers reached bedrock. If a natural source of water was around, surrounding the fortress with water was a potential additional benefit over the dry pit at stopping such tunneling. Either way, beyond making tunneling more difficult (or practically impossible), dry and wet moats, of course, helped dissuade above ground attacks as well thanks to moats being quite good at limiting an enemy’s use of siege weaponry. In particular, devices such as battering rams are rendered almost entirely useless in the presence of a large moat. Though the later advent of weapons such as trebuchets made moats less effective overall, they still proved to be formidable barrier capable of kneecapping a direct assault on a castle’s walls. All this said, it wasn’t as if proud moat owners didn’t put anything in them. There are plenty of ways to beef up moat defences without the need for water and crocodiles. Pretty much anything that slows an enemy’s advance works well. And, better year, anything that is so daunting it deters an attack at all. In fact, archaeological surveys of moats have found evidence of things like stinging bushes having once grown throughout some moats. Whether these were intentionally planted on the part of the moat owners or just a byproduct of having a patch of land they left unattended for years at a time isn’t entirely clear. But it doesn’t seem too farfetched to think this may have been intentional in some cases. As you might imagine, wading through stinging or thorny plants while arrows and rocks and the like are raining down at you from above wasn’t exactly tops on people’s lists of things to do. As for moats that were filled with water, while filling them with crocodiles or alligators wasn’t seemingly something anyone did, some savvy castle owners did fill them with fish giving them a nice private fishery. (As mentioned, artificial ponds built for this purpose were also sometimes a thing for the ultra-wealthy, functioning both as a status symbol, given maintaining such was incredibly expensive, and a great source of food year round). Moving back to the dry bed moats, when not just leaving them as a simple dug pit or planting things meant to slow enemy troops, it does appear at least in some rare instances fortress owners would put dangerous animals in them, though seemingly, again, more as a status symbol than actually being particularly effective at deterring enemy troops. Most famously, at Krumlov Castle in the Czech Republic there exists something that is most aptly described as a “bear moat”, located between the castle’s first and second courtyard. When exactly this practice started and exactly why has been lost to history, with the earliest known documented reference to the bear moat going back to 1707. Whether designed to serve as a stark warning to potential intruders, a status symbol, or both, the castle’s grizzliest residents were tended to by a designated bearkeeper until around the early 19th century when the practice ceased. This changed again in 1857 when the castle’s then resident noble, Karl zu Schwarzenberg, acquired a pair of bears from nearby Transylvania intent on reviving the tradition. From that moment onward, outside of a brief lapse in the late 19th century, the castle’s moat has almost always contained at least one bear. Today the bears are most definitely completely for show, and each year bear-themed celebrations are held at Christmas and on the bears’ birthdays during which children bring the bears presents. If bears aren’t you thing, Wilhelm V, the Prince Regent of Bavaria, in the late 16th century supposedly kept both lions and a leopard in the moat of Trausnitz Castle while he lived there. However, again, it appears that Prince Wilhelm kept the animals more for show and fun than he did for defence. Beyond dangerous creatures, his moat also contained pheasants and a rabbit run. Moving back to crocodiles being put in moats, the earliest reference to something like this (though seemingly just a legend), appears to be the legend of the Coccodrillo di Castelnuovo. In that castle, there was a moat under the level of the sea, dark, humid, where the prisoners, who they want to more strictly castigate, were usually put. When, all of a sudden, they started to notice with astonishment that, from there, the prisoners disappeared. Did they escape? How? Put a tighter surveillance and a new guest inside there, one day they saw, unexpected and terrifying scene, from a hole hidden in the moat, a monster, a crocodile entering and, with its jaws, it grasped for the legs the prisoner, and dragged him to the sea to eat him. Rather than kill the creature, the guards decided to make the fearsome creature an “executor of justice”, sending prisoners condemned to death to meet their end in its toothy maw. Exactly where the crocodile came from and when this supposedly happened depends on which version of the legend you consult, though our favourite version suggests that Queen Joanna II smuggled it over to Naples from Egypt sometime in the 15th century with the sole intention of feeding her many, many lovers to it. A consistent element in most versions of the legend is that the beast bit off more than it could chew when it tried to eat a leg of a giant horse, ultimately choking on it. Of course, this is generally thought to be nothing more than a legend, with no evidence that it actually occurred or even exactly when. At least the story does show that the idea of a crocodile in a moat isn’t just something found in modern pop culture. Did the Warrior Women Known as the Amazons Ever Exist? Moats are starting to make a bit of a comeback in modern times, such as used to protect certain embassies from car bombings. There’s also a concrete moat around the parts of Catawba Nuclear Station that isn’t bordered by a lake, again for the purposes of protecting against car bombings and the like. On the note of poky plants planted in moats, there are variations of a popular Scottish legend that have the thistle playing a key role in foiling the attack of an invading force. In one such version of the legend, a nighttime raid on Slains castle in modern day Aberdeenshire was foiled when sneaking Norsemen stepped on the thistles and cried out in pain, alerting the guards that a surprise attack was eminent. It is sometimes further stated that this is how The Most Noble and Most Ancient Order of the Thistle of Scotland was established and how the national flower of Scotland was chosen. Of course, there isn’t any documented evidence that exists to support the various versions of this legend. oah so the reason why we even think of “croccodile in the moat” is because of a legend of one wondering into it? that is very interesting, i have actually wondered a while back how the idea of croccodile in moats even emerged. also i allways did assume that every single one had water in them forcing any attackers to swim through and slow down but thinking about it now… all they needed to do is bridge the gap with a long lader or something which would also negate the deterant of animals in it.